The Prince of Wales has praised the "community spirit" of flood-hit Cumbria during a visit to the county. In Workington, Prince Charles viewed the extent of the damage to the town which was cut in half when floods destroyed or damaged its bridges. He also met construction workers building a temporary train station to provide links to residents forced to make long detours. He then went to Keswick where he switched on the Christmas lights. 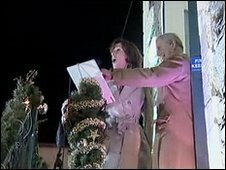 Thousands of people packed the town's ancient market square to watch the prince switch on the lights. He said: "I'm enormously touched to have been asked to help switch on the lights, particularly as I know how much you have all been suffering from this perpetual rain and floods. "The least I could do was to come and see how you're all coping. "The good thing is to get the message out to the rest of the world that Keswick and the Lake District are open for business. "If I may just offer my heartfelt sympathy to all those who live here who have had to put up with appalling conditions and to wish you the happiest possible Christmas." It was hoped his visit would reinforce the message that the area, which relies heavily on tourism, was still open for business. The countdown to Christmas and the New Year is a peak time in the tourism calendar, and media coverage of the worst-hit areas has triggered a string of cancellations. Linda Furniss, Keswick tourism officer, described the royal visit as "wonderful" for the town. She said: "The support this will give us will be just amazing, we appreciate it so much, it will pull the whole community together." At Northside Community Centre, Prince Charles spoke with workers distributing essential food supplies from a temporary storeroom set up in the building. Many residents have been unable to reach shops, so essential items such as bread, tea and coffee, pet food, toiletries and clothing have been donated by supermarkets.